Use a combination of waxy or “golden” (such as Yukon Gold) and russet potatoes. The russets provide “loft,” but the goldens taste as if butter already had been bred into them in the field. After they’re done boiling, always steam away any residual moisture from the cooked potato chunks. The potatoes must be dry before both mashing and adding the cream and butter. 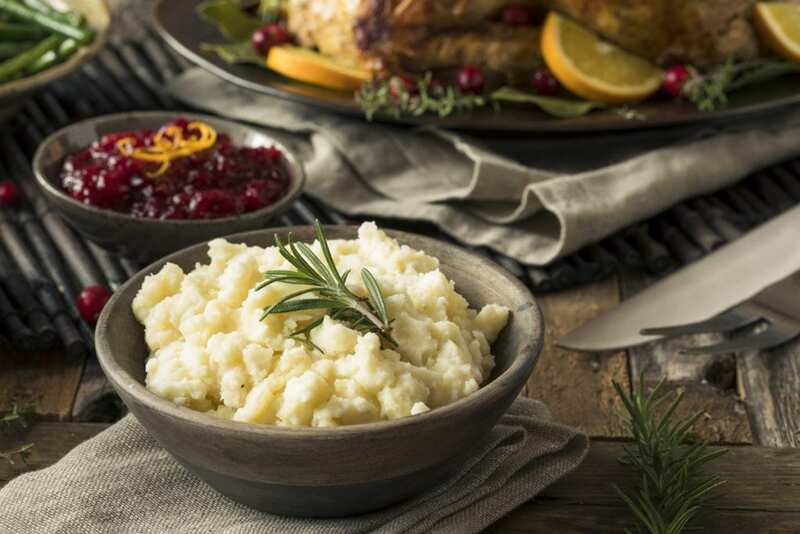 If not, any leftover water both dilutes the flavor and makes the mashed potatoes, well, watery. At the very least, additions of any sort must be room temperature or, better, warmed. (The cream and butter ought be hot.) You won’t get the salt ratio right if the potatoes are cooled down. Mash them or rice them or push them through a food mill, but don’t process them. The latter is difficult to control (they can get gummy in an instant) and batching them in the small bowl of a processor cools the lot down. Peel and cut up the potatoes into same-size chunks. You may retain as much potato skin as you like for flavor, texture or nutrition. Skins-on pretty much just change the looks. In a large pot, cover the potato pieces with 2 tablespoons salt and cold water and bring to a moderate boil. Cook for 15-20 minutes or until a knife easily pierces a chunk. Meanwhile, in a small pot or pan mix together the cream and butter and slowly melt the butter, not allowing the liquid to boil or foam. When cooked through, drain the potatoes in a colander or, if you can manage it, holding the top of the pot cracked just enough to let the water out. Return or keep the potatoes in the pot, without its cover. Place atop a slow fire (or in a heated oven) and let any residual moisture steam away. Stir the cream and butter mix and add about half of it to the potatoes in their pot. Smash away, adding more of the cream and butter mix until the potatoes are smooth and fluffy but still have some lumps within. Season to taste with salt and pepper (you may use white pepper). Serve immediately or keep warm in the oven (no more than 250 degrees). Colcannon: A famed Irish prep of mashed potatoes. Keep back 1 stick of the butter and get it to room temperature. Peel, core and finely shred (as if for cole slaw) 1 head of green cabbage, cooking it thoroughly, turning often, in a very small amount of water. Fold into the basic recipe; serve in a large warmed bowl with a hollowed-out top in which you are melting the reserved stick of butter. With Olives and Lemon: Mix into the basic recipe 3/4 cup of any combination of pitted and chopped green, purple or black olives, plus the zest from 1 small lemon. With Sage Brown Butter: Separate the cream from the butter and warm it in its own small pot. Melt the butter in a large skillet and add a dozen or more leaves of fresh sage (if large, torn) and crisp them as the butter browns slightly (do not burn the butter, but do brown it slightly). Mash the potatoes initially with the cream only, adding the melted butter and sage leaves toward the end of the mashing. With Garlic Roasted in Olive Oil: Use very good quality extra virgin olive oil here. Omit 1 stick of butter. In a small ovenproof dish or ramekin covered in foil, roast 12-14 peeled cloves of garlic for 30 minutes at 350 degrees in 1/2 cup olive oil. Proceed with the basic recipe, mashing in the roasted garlic and olive oil.